Blepharophimosis syndrome is a clinical entity which is characterized by presence of a small palpebral aperture in its overall diamen­sions. It is a congential condition in which apart from blepharophimosis there is presence of telecanthus, epicanthus inversus and bilateral ptosis., This condition causes a great cos­metic blemish and hence its surgical treatment is most desirable. The purpose of this com­munication is (1) to present the relevant data of the largest series of cases in India studied at Dr. R.P. Centre in whlch certain addi­tional findings were noted. (2) To highlight the difficulties in surgical management of tele­canthus, blepharophimosis and ptosis. 25 cases which presented during last 3 years were studied. 17 cases were operated. The operation done was lateral canthoplasty by Agnew's method in the Ist stage. In the second stage epicanthus with telecanthus repair was undertaken mainly by Mustarde's rectangular flap operation. The third and the final stage dealt with the correction of the bilateral ptosis with levator resection by skin approach. All the cases presented to us had the com­mon features of blepharophimosis, telecanthus with epicanthus inversus and bilateral ptosis. There was presence of ectropion of the outer 1/3 of the lower lids in 23 cases. Entropion of the lower lid in the medial part was seen in 20 cases. 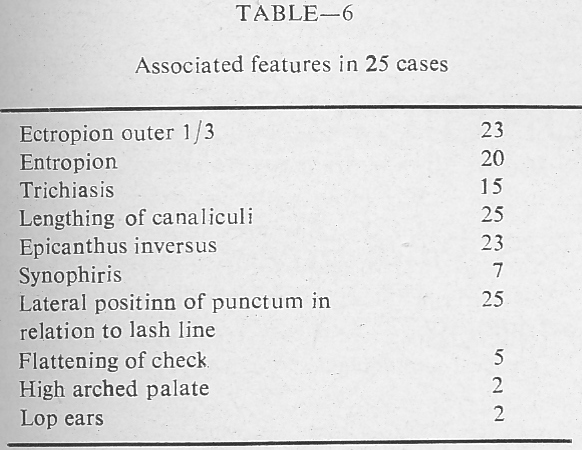 In 15 cases trichiasis was present and the lashes were rubbing on the cornea. The position of the punctum was situated laterally in relation to the lash line and there was lengthening of the canaliculi. The flat­tening of the cheek bones was present in 5 cases and eye brows were joined in 7 cases. High arched palate and lop ear deformity was seen in 2 cases. The ptosis was of quite severe degree in most of the cases and the L.P.S. action was poor. The fron­talis overaction was noticed as evident by arching of the brows and wrinkes on the forehead. The chin elevation was present due to bilateral ptosis. 1. Lateral canthoplasty : The purpose was to enlarge the horizontal dimension of the palpebral aperture. The proposed site of the new lateral canthus was marked by gentian violet. The lateral canthotomy was done upto this mark. The conjunctiva was mobilized and was sutured with 6 o' black silk to this new canthal area. A double arm suture was then passed and the knot was tied over a rubber peg. 2. Repair of telecanthus and epicanthus in versus : Two methods were tried. The one was by Y-V procedure of Verwey and the other was by Mustarde's rectangular flap operation. In both the operations the shor­tening and medial shifting of the medial palpebral ligament was done. Merselene thread was used for fixing of the medial palpebral ligament without any use of stain­less steel wires and bone drill. 3. Levator resection by skin approach was done in all cases except one case in which facia lata sling was done. 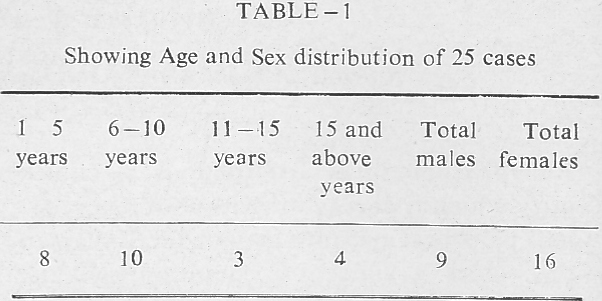 All these steps were carried out at the interval of 4 to 6 weeks under general anaesthesia. The surgery of blepharophmosis syndrome requires a lot of patience on the part of sur­geon as well as the patient. In the lateral canthoplasty of Aginew the proper mobiliza­tion of conjunctiva after doing the lateral canthotomy and cantholysis is a must before attaching the conjunctiva on the skin at the proposed lateral canthus. The passing of double arm suture helps to form the lateral fornix. The lashes which are absent from the lateral portion of the lid margins at the lateral canthus can be substituted by pencil liner and does not cause any significant cosmetic problem. The Mustarde's rectangular flap operation for correction of epicanthal folds give good results in comparison with the Y-V procedure of Verwey., The paramarginal incisions should be made first and the lids must be stretched at the time of making the incisions to avoid the damage to canaliculi and also avoid subsequent postoperative ectropion. The telecanthus part is the most difficult to tackle. Good results are only obtained in mild variety of telecanthus not exceeding more than 8 mm. The difficulties we have come across is damage to the canaliculi and sac while mobilizing the medial canthus while bodily shifting it more medially. We have shortened the medial palpebral ligament and advanced it medially and fixed it to the perio­sleum by use of merselene thread. We have not tried the transnasal wiring of the medial canthi as suggested by Callahan for the fear of retaining a foreign nonabsorbable material in a relatively infected area, The other problem was maintenance of the depth of the medial canthi and after operation the canthi gave an appearance as if they were stretched and the puctal apposition to the globe was lost leading to epiphora in the postoperative period. Massage in the post­operative period in the region of medial canthus helps in avoiding the scar and the keloid formation. The gradual recession of the newly formed medial canthi in the post­operative period can be overcome by planning for a little overcorrection on the table. Occa­sionally a suture granuloma formation can occur. Once the associated deformities are correc­ted then the ptosis is carefully assessed. Usually bilateral sling has been recommended at the age when the length of the lower limb is enough to provide sufficient facia lata. Levator resection through skin approach has given good results in our hands. The levator in these cases is very thick and fibrosed and it is difficult to get more than 18 mm of the muscle. There is usually more bleeding at the time of dissec­tion of the levator. The lid skin being thick and not laxed as against usual cases there is a tendency of ectropion resulting after forma­tion of lid fold. The condition of blepharo­phimosis involves both eyes and hence every stage of the operation should be done on both sides at the same sitting by the same surgeon to give an adequate result. However, there remains much to be done in the management of these cases and the surgeon has to be realistic about it. 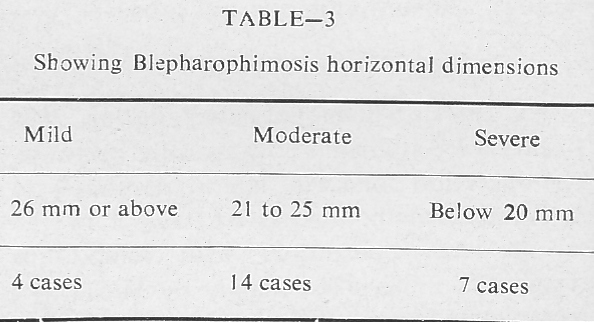 A large series of 25 cases of blepharophi­mosis syndrome is presented. Surgical treat­ment was carried out by lateral canthoplasty, Mustarde's retangular flap operation and levator resection by skin approach. The difficulties in surgery and the various compli­cations are highlighted. Kohn, R. and Romano, P.E., 1971, Amer. J. Ophthalmol. 72 : 625. Beard, C. : Ptosis, 3rd edi. The C.V. Mosby Co. Saint Louis, 1981, pg. 211. Agnew, cited by Arruga, H. Ocular surgery, New York, 1952, McGraw Hill Book Co.
Mustarde J.C. 1964, Int. Ophthalmol. Clin. 4:359. Hughes, W.L., 1955. Arch. Ophthalmol. 54: 586. Callahan, A. Acad. of Ophthalmol. St. Louis 1974. The C.V. Mosby Co.